... e c'è una pioggia di sorprese, che ti aspettano domani e ancora! It's the last day of June and I am sitting in my room to (1) avoid the intense heat outside and (2) reflect on my first month here in Perugia. It has definitely been a wild ride. I've seen and experienced so many things that I had never imagined. I've met some fantastic people from all over the world and I've learned so much Italian in such a short time. I've learned what it's really like to live away from home (to miss your family and friends greatly), but I've also learned how to value them more, I think. In essence, I've become independent. And now many of the things I've spent the last time building up will change. My classes for June ended this past Monday. Most of my classmates spent the week taking exams to earn certification, but I didn't. Starting next week, I enter a whole new month of classes with new classmates and, most likely, new professors. In addition, I'll be spending both July and August taking intensive courses in the Italian language and culture, so I am expecting the difficulty level to go up! We'll see how that goes. On top of that, many of the friends I made over the last month have left or are leaving in the next few days. Some of them were here for many months prior, others just one. It's honestly weird to see that happening so early into this trip. Most of them aren't ready to go home just yet, and who can blame them? Perugia is really a beautiful city in many aspects. At the same time, it has made me evaluate the five and half months I have left here. This city is international. I heard it time and time again before leaving, but I didn't expect it to be a home for so many immigrants and other foreigners. Everywhere you go, you'll find a foreigner. Being at a university for foreigners, that's especially true for me. In addition to meeting many Italians, I've met or become friends with people from China, Spain, Macedonia, Bangladesh, Belgium, Venezuela, Palestine, the Dominican Republic, France, Turkey, Brazil, South Korea, England, Pakistan, Poland, Jordan, the U.S., Japan, Albania, Mexico, El Salvador and Germany. There are others, no doubt, but it's kind of of hard to keep track of them all! At the same time, the Italian spirit shines through. Nowhere was it more apparent than in the center city on Thursday night, right after Italy defeated Germany to advance to the Eurocup final (which takes place tomorrow). The celebration started immediately after the game ended, at about 10:30 pm. Any cars that decided to drive through the large crowd were rocked back and forth by Italians as they tried to drive on. Most of the drivers grinned as their cars were shaken wildly. Things were even crazier for motorcyclists, who were almost thrown off their motorcycles, haha. Flags were waved non-stop all night. They were accented by the green, white, and red smoke of fireworks that were set off every couple minutes. By the time I decided to get some sleep (around 2:30), the party was still going, although it had calmed down substantially by then. One of my New York friends remarked how this wouldn't be possible in NYC without a few fights breaking out. Imagine this, but much larger! So, even as I lose some of the friends that I made in June, I know I'll meet and make many new friends. At least, that's my hope! My friend Claire (who I know from an Italian class at Grand Valley) arrived this Tuesday. Our friend Bridget (also from my Italian classes at GV) arrives tomorrow. That has changed the dynamic of being the lone Michigander quite dramatically, but I'm excited! There are still many things to do and many places to see here in Italy, and I'm glad I now have them as travel buddies. 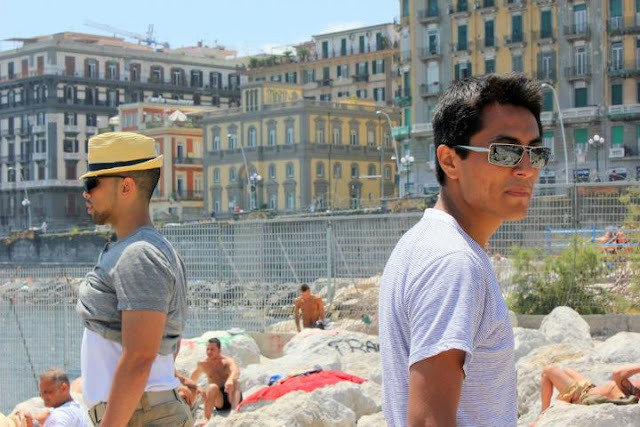 Select pictures from a weekend of fun in southern Italy! 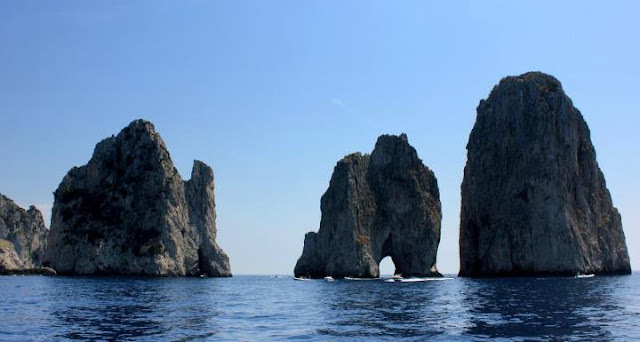 The day after touring Napoli and Pompeii, we boarded a ferry at 8:15 in the morning to head toward the island of Capri, off the Sorrentine Peninsula. It took about an hour to get to the island (including stops). Aside from the scorching sun beating down on us, it was a pleasant ride. The sea breeze more than made up for the sun. Immediately after getting off of the ferry, our large group walked over to a long line of boats that toured around the island. The night before, most of us had decided to do the tour, as well as go into Capri's famous "blue grotto." We left the harbor at about 10 in the morning and began our tour around the island. The sea breeze was really just incredible. I am not sure I can fully describe how amazing it feels! After about half an hour, we reached the entrance to the Blue Grotto. There was already a pretty big group of boats waiting to enter, though, so we had to wait. That's when the trouble started. As the waves rocked the boat back and forth, people started feeling sea sick. One of my friends couldn't hold it in and threw up off the side of the boat. Almost immediately, fish swam up and devoured her vomit! I still can't decide if that's cool or gross! Finally, around 11:15, we were up. In order to enter the grotto, which has a very small opening, we had to get into smaller raft-sized boats that only fit four to five people. Because the sea wasn't completely tame that day, we also had to wait at the grotto opening (with our heads ducked) until the waves died down a little. It was well worth the wait and the 12.50 euros we paid, though. Once inside, the view was incredible.The guides in the boat with us started singing "Nel blu dipinto del blu" (better known as "Volare")--very appropriate! The grotto was much smaller than I had imagined, and we only went around it once before exiting. Nonetheless, it's one of those experiences you'll never forget. After everyone had made it back onto the larger boat, we finished going around Capri and got back to the port at 12 on the dot. 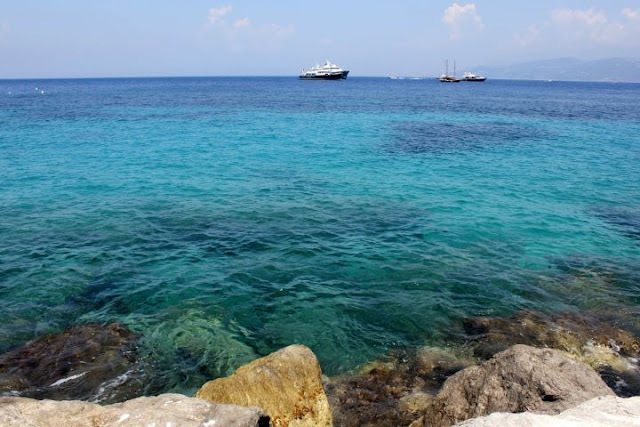 From there, a group of friends and I headed to Capri's rocky beach. The sand was scorching hot! I honestly felt like I was walking on coals. I definitely should have brought my sandals with me. Lesson learned. The salty, cool sea water made me forget all about that, though. Serenity. After a swim in the Mediterranean, courtesy of my friend Melanie! Fun fact about that Sunday: I had lemonade at the restaurant, a lemon "granita" a while after, and later a bit of Limoncello. During our bus ride back to Perugia, I picked up a lemon-flavored Gatorade...and during dinner I had a Sprite. I am not sure what I was thinking that day, but I was definitely in the mood for lemon-flavored drinks! Napoli, Pompeii, and the island of Capri are all beautiful places. At least they are in my opinion. On Saturday and Sunday of last weekend, I once again ventured off to explore the Italian peninsula with a group from Stranieri. This weekend was bittersweet, however, because for many of the friends I've made over the past few weeks, this would be their last trip before they headed back home. I was up at 5 a.m. once again this Saturday. Whereas last week I had made the mistake of forgetting to pack some essentials, this week I made sure to fill my backpack the night before with items I would need over the weekend. Our first destination was Napoli, a city that is notorious throughout Italy for being chaotic. I've heard Napoli be described as Italy's Detroit on a few occasions (usually referencing the run-down nature). Regardless, I was excited to check out the city for myself and draw my own conclusions. Our bus arrived in the city at about 11 a.m., which gave us about 5 hours to walk and sample what Napoli had to offer. Welcome to the Spanish Quarters! Our first order of business was, naturally, getting food to eat. My friends Melanie and Rafael (Dominican-Americans), Ben (English), Eduardo (Salvadoran) and I decided to head straight into the Spanish Quarters to find a place to eat. We joked about finding the most rundown-looking place to eat, expressing our desire to experience the rawness of Napoli. Eventually, we settled for a small trattoria-like restaurant. We were the only customers there (great! ), there was also only one person on staff (fantastic! ), and when we were given our menu, we saw everything was written out (awesome!). Shortly before ordering, our waiter left the restaurant, which we naturally assumed was because he needed to find some ingredients for the food he was about to prepare us. Long story short, we spent the entire time laughing it up as we imagined the horrible things our waiter must have been doing with our food. The meal wasn't all that good, but we managed to have a fantastic time, nonetheless. The waiter/cook was friendly, but I'm sure he must have thought we were insane! After paying and leaving the restaurant, we walked down Via Toledo (where there are tons of places to shop) and met up with a few other friends who were looking for a place to eat. They had first toured a few of Napoli's famous buildings, which we had skipped in order to head straight into the Spanish Quarters. After they split off to go eat, Ben suggested we head toward Napoli's port, which sounded like a fantastic idea. On the way there, we got to see more of what makes Napoli an interesting city. Old buildings throughout were tagged with graffiti, which made for an interesting look. The sidewalks were littered with garbage, but shops were well-taken care of. As we got closer to the harbor, we started to see the sea and Mt. Vesuvius far off in the background. It was a spectacular sight! We spent some time walking around the port and "beach" area before heading back toward the historic center to do some more exploring before we had to leave. I stopped by an H&M to pick up a pair of trunks. We went through the Spanish Quarters one last time before heading to our rendez-vous point at 3:45. After getting back on the bus, our tour guide told us we were off to one of Napoli's nicest parks to take a few photos (if we wanted to). After a few minutes of doing that, we were back on the bus again on our way to Pompeii! Thankfully, Pompeii was relatively empty when we got there. The fact that the sun was going down only made things better, as it wasn't too hot to walk around. Rafael and I split off from our massive (50+) group and headed toward the Roman amphitheater. Unfortunately, we couldn't climb any stairs inside the amphitheater to get a really good picture. Still, being able to walk in there at all was great. From there, we went came back toward the point where we had split off from the group. We then walked toward the remains of wealthy Romans' houses. We found the famous casts of humans that are synonymous with Pompeii. I felt uneasy thinking about their last few moments alive. There were four casts, two of which were in a lying down position. They probably didn't even realize they were covered in magma before it was too late. Another was crouched and seemed to be holding something (a baby? ), which was particularly sad. We walked around a little further and up a hill where we got to see a city, mountains and the sea off in the distance. 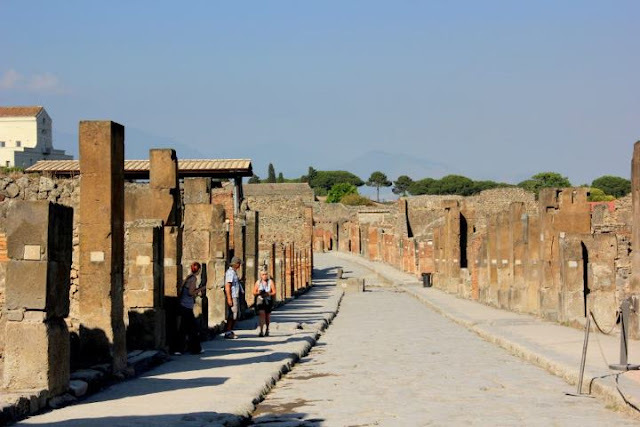 For the devastating demise that Pompeii suffered in the year 79 AD, today it is a pretty serene and peaceful landscape dotted with columns and ruins. 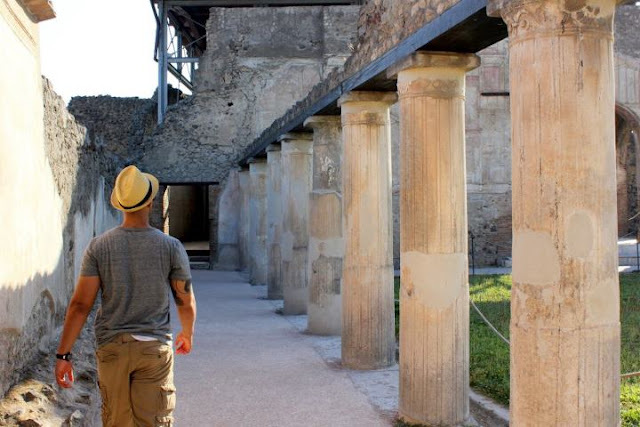 Rafael and I finished touring Pompeii at about 7, so we walked back to our meeting point for our 7:30 departure. On our way to the exit, we found a man looking at a sign with confusion all over his face. I asked him if he spoke Italian, he said yes, and then I asked him if he needed help. The sign he was looking at said exiting from the path we were heading toward was forbidden. However, the other exit was blocked. We decided the sign was wrong and left from where we had entered. On our way down, I talked with the man for a few minutes. He asked where we were from, and then told us he was German-French, but had been living in Italy for a few years. When I mentioned I was Mexican-American, he asked if I spoke Spanish. Then he added that he had studied the language in high school, but had since forgotten it. I mentioned I was in a similar place with French, which made us laugh. Rafael and I had seen him walking around Pompeii earlier. He was easy to remember because he was badly cut around his knees and legs. The injuries looked fresh, so I asked him what happened. Apparently, he had been on Mt. Vesuvius earlier that day and was late to catch his bus to Pompeii. As he was running down the mountain, he fell and cut himself badly. At the gate out of Pompeii, we parted ways. Sometimes you meet some really cool people while traveling! After we were all back on the bus, we were once again on the road. This time, we were heading to our hotel in Castellamare. After a shower, a good dinner, and reserving a spot for a ferry ride around the island of Capri for the next day, a large group headed out to check out Castellamare at night. We walked by the beach, which was littered with trash (unfortunately), and found a plaza where a group was playing music. The atmosphere here was great, with people taking part in a dance that Ben said was Greek. The band members spoke in the Neapolitan dialect, so a lot of what they were saying was lost on us. Regardless, it was a fantastic time! We had to be up at 6 the next morning, so I turned in around 12. It had been a wonderful day, and Sunday promised to be just as good--and maybe even better! Last weekend in pictures. Click on a picture to make it larger. This past weekend I spent Saturday in Venice and Sunday on the small islands of Murano and Burano. This was my second trip with the travel agency affiliated with Stranieri and it was even better than last week's in Spello! I woke up at 5:00 am (very early!) on Saturday morning to get my things ready in time to make it to the tour bus at 6:00 am. The bus ride to Venice was about 4 and a half hours of rolling hills, light sleeping, and listening to our tour guide, Riccardo, talk about the history of Venice, as well as what the plan was for the weekend. The first thing you see when entering Venice is a large bridge that was constructed in the 1950s. This is the only modern bridge of the hundreds you can cross in Venice! If I remember correctly, Riccardo mentioned that there are over 400 bridges and over 100 small town squares. We traveled as a group to Piazza San Marco, Venice's main attraction. Although it took a good hour or so to get there, the path was marked very clearly so tourists wouldn't have much trouble. By the time we finally arrived in Piazza San Marco most people were starving, so we split up and went on our way to find food. Just as last week I joined the group of Dominicans from New York, although the group was a little bigger this time. We ended up finding a nice-looking restaurant not too far from the the plaza. The food was great and our waiter was awesome. Although most of us ordered and spoke with him in Italian, we had fun talking to him in English and Spanish as well. I ordered a pizza "diavolo" which was supposed to be spicy, but wasn't. That might just be because, as a Mexican, I've been desensitized to mildly spicy food! After lunch we walked back to Piazza San Marco and took in the beauty of the square. A hat that resembled a ship captain's caught my attention, so I bought it for 6 euros. There was a ton of stuff to capture with my camera, so I kept stopping in my path and taking pictures. For me, the main attractions were the pigeons, though, because I had been looking forward to frolicking taking pictures with them all week. My friend Melanie, who is a photography major, got some excellent shots of me courting the pigeons with bread crumbs. It took a while for them to realize I was trying to get their attention, but once one noticed, the rest came. At one point, I had three feeding simultaneously while perched on my arms. ...but they came soon enough! This was right before I yelled, "I am pigeon man!" We decided to make our way to the top of the tower in Piazza San Marco to get a good video of the city from above. In the line, we spoke to a Mexican couple from San Diego who were in their last few days of a cruise around the Mediterranean. We rode an elevator to the top of the tower and then took turns going from window to window and looking at Venice and the surrounding islands from above. By the time we had descended, one of the other groups had made it out of Saint Mark's Basilica so we came together and walked around looking at all the souvenir stands. View from the bell tower. At about 5:30 pm, me and my friends Rafael, Eduardo and Melanie split off from the other groups and headed back to the bus station where we had been dropped off. We had a 7:00 pm checkpoint to make at the station and, since we had decided to walk back, we had to leave earlier than the groups going by boat. This turned into a grand misadventure. We started off just fine and followed the posted signs, but somewhere along the way we stopped seeing them. After about half an hour of walking aimlessly and saying "oh yeah, I remember this place" (when, in fact, we didn't), we pulled out our map of Venice and asked locals to help point us in the right direction. We were probably very close to heading toward the grand canal and just taking a boat back when we turned a corner and found one of the major bridges we crossed earlier in the day. We were ecstatic! It was about 6:15 when we crossed this bridge. From here, it was smooth sailing again and half an hour later the station was in sight. Before boarding the bus, I picked up a few postcards. The shower and dinner at the hotel felt like heaven after spending the day walking around Venice under the scorching sun. Rafael and I were both surprised by how much food we were given for dinner. We sat at a table with Eduardo and Riccardo and talked philosophy, politics, identity, humor, and life in general. The next day, we were up at 7:30 am to eat breakfast provided by the hotel at 8:00. By 9:30, we were back at the bus station in Venice to catch a ferry to the islands of Murano and Burano. The ferry ride to Murano, our first stop, was refreshing. I couldn't resist the urge to fall asleep as I was rocked by the ferry and soothed by the fresh sea air. We made it to Murano around 10:10. Here, we were treated to a demonstration of glassblowing, which was really cool. In no more than 5 minutes, the man made a vase, a horse, and a swan. Afterward, we spent some time in the shop owned by the glassmith and his family. There were a ton of cool things in there and most people had a field day buying souvenirs here. One of my favorites in the shop. Our next stop was the nearby island of Burano, which was easily the most beautiful place we visited this weekend. Compared to the tourist-packed Venice, Burano was quiet and peaceful. The houses are all colored distinctly, which according the Riccardo can be explained by one of four popular legends. They range from reasonable (to help the fisherman make it back during foggy winter days), to comical (because the wives of the fishermen decided it was necessary so their husbands could find their own houses when they returned drunk from drinking at sea all day), to historical (famous figures came to the island to be inspired and one artist started the tradition by painting one of the house) -- pick your favorite! Burano: the perfect island for picture-taking. The group I was with was able to explore the small island in less than the two hours we were given to look around, so we spent some time in the shade by the ferry as we waited for everyone to regroup at 1:00. From here, it was back to Venice for the next four hours to check out any monuments we hadn't seen the day before. In Venice, our group had lunch. Back in Piazza San Marco, I tried feeding the pigeons again, but was stopped by an official-looking, orange vest-wearing, and "prohibited" card-waving couple. I watched as they walked over to a little girl with her dad and did the same thing. Dream crushers. We departed from Venice on ferry again at about 6:45 pm, 15 minutes later than our scheduled time. This was because a group of French tourists that were sharing the ferry with us was missing some of their members. We later found out they wanted more time to shop, but the captain wasn't having it. A very unfriendly French lady who must have been leading the group marched onto the ferry and used to its megaphone to give the tourists a final warning. She stormed off a few minutes later. By this time, everyone was sick of waiting and the captain decided to get going. The other French people didn't make it back in time. A few minutes past midnight, we were once again back in Perugia. I was tired and in need of a shower, but was content. It had been another incredible weekend of sight-seeing with great friends. Venice, Murano & Burano -- thanks for the memories! On Tuesday of last week I signed up for a group tour of Spello, a small town south of Perugia, during their annual flower festival celebrating Corpus Domini, which took place this past Sunday. When I signed up, I figured that it would not only be a good way to meet new people and make more friends, but also that it would be a good excuse to go out and take more pictures. As scenic as Perugia is, I'm about all about diversity of subjects when it comes to photography. I had no idea when I signed up, though, that I'd be in Spello twice this past weekend. On Thursday, I happily accepted an impromptu invitation from one of my Korean classmates to go with her and a friend on Saturday. After all, I thought, how many times will I actually get to visit Spello? So, after sleeping in until 11 on Saturday morning, I headed out to meet my friend Sophia and her friend Angela at Pizzeria Mediterranea in the center city around 1:00 pm. We each ordered different things and sampled a little bit of each--they were all delicious! After lunch, we went on our way toward the train station via Mini Metro. The ticket to Spello via train was only 3.20 euros -- cheap! Not to mention the ride was pleasant and there was plenty of space in the train. After we arrived in Spello, we walked around for a few hours just touring the town. Angela and Sophia had hoped to see some of the flower artwork from l'Infiorata out already, but most people were just beginning to set up. It wouldn't be until Sunday that the actual festival would take place. The three hours or so we spent in Spello that day included touring the town, eating gelato, taking pictures, and buying postcards. All in all, it was a successful day. We left Spello around 5:30 pm and made it back to Perugia at 6:00 pm. On the train ride back, one passenger got into a heated discussion with the ticket inspector. Not sure what became of that. The next day I was up at 6:00 am getting ready for the day trip to Spello and the only waterfalls in the Umbria region, called le Cascate delle Marmore, with a group from Stranieri. Our group of 30 or so departed from Perugia at about 7:15 in a tour bus. The tour guide, Riccardo, cracked jokes and explained a little about what was going to happen in Spello during the ride. He spoke slower than most other Italians, which he said was to make sure everyone could understand at least a little of what he was saying. The group had people on it ranging from all levels of Italian language proficiency. By the time we arrived in Spello, there were big crowds all over. Tents selling flower-related products had been set up near the entrance to the city overnight. After we got off the bus, we were given directions to return by 1:30 pm and then were left to roam the town on our own. At first, I floated around looking for good picture-taking opportunities and a group to tag along with. 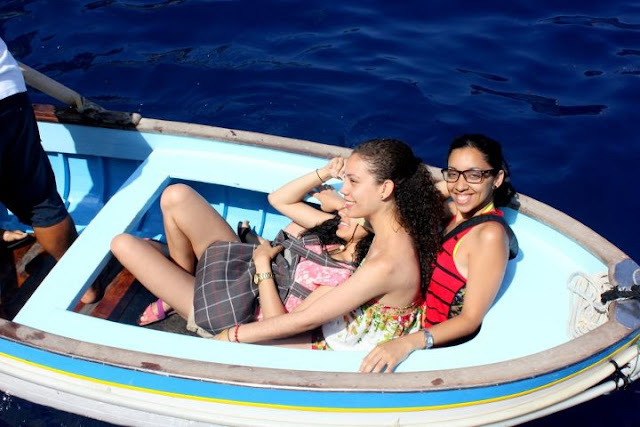 About twenty minutes in, a group of four Dominican-American girls invited me to tag along with them. I am sure they could tell I was looking for someone to hang out with -- and I am glad they did, because I had a blast that day with them! After watching a procession from the church at 11:30ish, we decided to take a break from walking and find a place to eat. This was harder than we imagined as most places were packed with people. After a few tries, we found a bar with a garden area. The view here was spectacular. Looking out at the mountains as we waited for our food and talked was a treat. A bar with a view! We finished eating just in time to take a bathroom break and some of us got gelato before boarding the bus. At 1:30 we were on the road again, this time on our way to "le Cascate delle Marmore." On our way there, the group made the decision to stop by a place called "le Fonti del Clitunno," a beautiful park and small lake with blue-green water surrounded by weeping willows. We were only there for about an hour, and at 3:00 pm we were on the bus once again. After Riccardo finished giving his pre-arrival speech loaded with jokes and info about the waterfalls, I took a nap. I woke up as we arrived at le Cascate delle Marmore, a few minutes before 4. It didn't take long before we set our eyes on the waterfalls. They were simply incredible. If you got close enough to the rail, you were sprayed with the falling water. The waterfalls aren't natural; like many other things in Italy's Umbria region (nicknamed the "green heart of Italy"), they were made by the Romans. This weekend I learned that I love waterfalls. The picture above was taken from the base of the waterfall, where we started off. From here, we had a good half hour hike up a hill to reach the top. Along the way, I kept stumbling, which is odd because anyone who knows me well knows I'm incredibly graceful (not). Halfway up the path, there was a fork where you could choose to keep going up or instead walk through a cave that led to a small ledge that was right next to the waterfalls. The entire group went toward the second path and everyone had a turn going out onto the ledge and getting soaked by the waterfall. Honestly, that was one of the best moments of the entire weekend! I bet there are few things that make you feel as alive as standing right next to a roaring waterfall and getting drenched! Now soaking wet, we made our way through the cave, took a picture and returned to the fork in the path to keep going up. About twenty minutes later, we were finally at the top! Obviously, this meant more picture taking opportunities! At the top of the waterfall with my new friends: Estefania, Ivelisse, Arlleen & Omaira! We ended up looking around a few souvenir shops and eating some ice cream before heading back down. As we passed the waterfall near its base again, we caught sight of a rainbow. Appropriate way to end a fantastic weekend? I think so! After taking the very informal oral section of the entrance exam at Stranieri on Monday June 4, I was placed in the C1 level (the first of two advanced levels). After visiting the enrollment office, being told I couldn't register for the ongoing C1 level course, and then having a professor vouch for me, I was all set to begin classes the next day! Unfortunately for me, I still had plenty of things to take care of prior to starting my Italian language and culture classes, such as securing my residence permit, getting my "codice fiscale" to obtain my one-month scholarship money, and meeting with professors and staff from l'Università degli Studi di Perugia (the University of Perugia). I ended up missing my first day of class (Tuesday) to accommodate visits to various agencies around the town in my quest to obtain important documents. With these things out of the way, I went to bed on Tuesday night a little nervous about finally beginning classes. However, I was also looking forward to the structure they would bring to my days, which up to this point had been chaotic. The day started with me getting to my 8:00 am class (Translation Exercises from English to Italian) around 7:55. I waited for a few minutes past the hour, but no one was showing up, so I assumed I must have been in the wrong room. I went down to the International Students Office, explained what was happening, and then asked for help. The response from the man behind the desk was that I was too early for Italians. I had to smile at that. He added that they would be showing up 10-15 minutes late, most likely. Sure enough, the first student showed up around 8:15 and the professor 5 minutes later. Two more students came in not long after, rounding out the class of 4 students: an English girl, a Korean girl, a Vietnamese woman, and me. At 11:00 am, I had another class called "Lecture on Contemporary Italian Authors." The professor in this class was incredibly passionate about what she was teaching, which made the hour go by really quickly. From there, I had a four hour break until 3:00 pm (or 15:00, as Italians would say). After a very inexpensive 2 Euro meal at the University of Perugia's cafeteria (called MENSA), I made it back in time for my 3:00 phonetics class. Among the professor's quirks, I enjoyed her referring to everyone by their nationality. 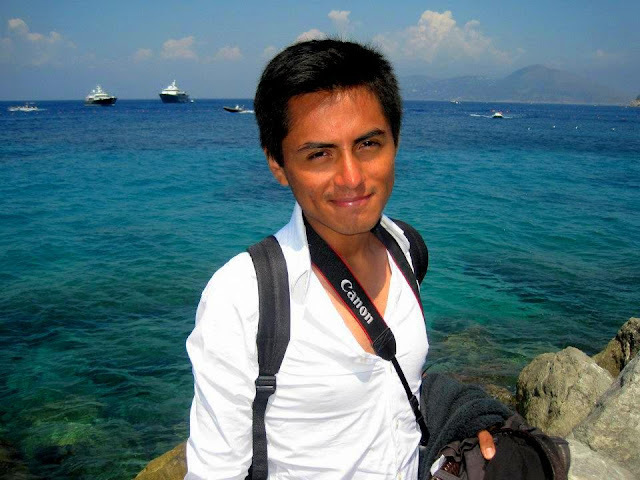 For example, I became Mr. Mexican, while others in the class were Ms. Spaniard, Ms. Russian, Ms. Venezuelan, Ms. English, etc. That class, too, was only one hour. Immediately afterward, however, I had another class with the same professor called "Exercises in Phonetics & Phonology" in which we practiced pronunciation in a language lab for another hour. At 5:00 pm, I packed my things and made my way back to my room after a successful first day. The day was far from over, though! Earlier in the week I had been in contact with three students from the University of Perugia who will be studying at Grand Valley during the coming fall semester as part of the exchange program I am participating in. We set up a meeting over dinner for that Wednesday afternoon, which turned into two hours of friendly banter in English and Italian, eating delicious food, and wine-tasting. Dario, Jearta, and Luana: if you read this, I just want to say again what a great time that was! Grazie mille! From there, I went grocery shopping at a popular store called "Coop." It was incredibly small and there were lots of people there at 8:00 pm trying to shop. Regardless, I made off with quite a bit of food for only 13 euros and, more importantly, it was quite the experience! You left me smitten, Coop. The day wrapped up nicely after Skyping with my best friends and my family. It had been a day so spectacular that it muted many of the doubts I had been harboring for the past few days. As I reflected on this, I kept coming back to what everyone I had talked to the past few days kept telling me. In essence, it was this: "You're in Italy, just enjoy it." I can honestly say that I didn't expect my first few days in Italy to be challenging, but they were. Prior to leaving, I'd heard a lot about how to cope with culture shock during the first few days in another country, but I foolishly brushed them aside, thinking I wouldn't feel any of its effects. I'm now two weeks into my study abroad experience and things are vastly different from my first few days here. In retrospect, however, I think I (1) fancied myself too "open" of a person to experience culture shock--yeah hubris!--and (2) I figured that Italy, as a Western country, wouldn't be too different from the U.S.
Of course, I was wrong on both accounts. After being led to my room, leaving my suitcase in a secure place, and getting an orientation of the building by the on-duty doorman, I took a minute to collect my thoughts and think about where to go first. I had plenty to do; in fact, at first it seemed like too much to do. From the haze that was the first day, I remember being frustrated that I hadn't had the foresight to pack adapters for my electronics, looking for a good source of internet, and constantly asking for directions while looking for l'Università per Stranieri di Perugia (the University for Foreigners of Perugia, which I will from here on out refer to simply as "Stranieri"). After finding Stranieri and being told to return on Friday (the next day) for my placement test, I stumbled upon a Greek "fast food" place where I ordered the specialty and used their wi-fi to get in contact with my family and friends via Facebook and Skype. The rest of the day was divided between fixing up my new room, walking around Perugia, and buying some basic supplies. I am sure that first day I must have stuck out as fresh meat really easily! I don't think I have ever had to ask for help from so many different people in one day. The same would be true for the next few days as well. On Friday it rained. My morning was crammed with different activities, including heading the the central housing agency with my residence's director to sign a contract, taking my written placement exam, returning to my room to finish rearranging it, and trying to get internet access. Before being released from our written exam at Stranieri, we were told to return at 11 in order to take the oral entrance exam. For whatever reason, I misunderstood "undici" (11) as "una" (1) and didn't come back until much later. Apparently, one of the coordinators named Corrado had been looking for me most of the morning. After apologizing for my mistake, I was told not to worry and just return on Monday morning to take the oral exam. Not until then would I know what my placement was. Corso Vanucci with Piazza IV Novembre in the background. Perugia, as seen from Piazza Italia. Restaurant where I had my first slice of Italian pizza. First Italy and now Jordan: unique times in my life chronicled in (some) words and (mostly) photographs. Let me know what you think!